The Daily Transcript pays tribute to San Diego County's Top Attorneys. View the finalists here. Good, honest and loyal employees are the greatest asset of any company. Unfortunately not all employees are great. Some employees are dishonest and others are vindictive. Not surprisingly, ex-employees who are discharged due to dishonesty are the most likely ones to post a defamatory blog about their former employer. Troutman Sanders is an internationally recognized firm with more than 600 lawyers and offices located throughout the United States and China. The San Diego practice covers a broad range of services including complex commercial litigation, intellectual property litigation, insurance litigation, and real estate and business transactions, led by Managing Partner Michael J. Whitton, named a Transcript 10 Top Attorneys finalist. Family members of those killed and survivors of the shooting at an Aurora, Colo., movie theater may find it difficult to pursue civil liability claims to compensate for their losses. 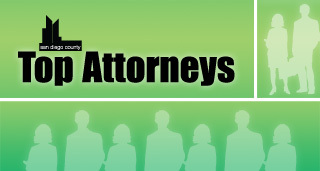 Top Attorneys 2012 pays tribute to San Diego County's legal cream of the crop. It is the culmination of a lengthy peer voting process that began in March with the announcement of a call for nominations. San Diego County lawyers were asked who among their peers -- with whom they had professional experience -- were worthy of recognition. The attorneys of The Gomez Law Firm gladly step into the ring for their clients when defendants don’t pay what’s fair. This boutique firm focuses on high-value and high-profile catastrophic personal injury, wrongful death, products liability, trucking litigation and elder abuse. The willingness of the attorneys to go to trial combined with their attention to detail, impeccable service and results-driven approach have allowed the firm to obtain more than $250 million in verdicts and settlements since 2000. Last year was especially tough for plaintiffs and consumers in the world of pharmaceutical litigation. As a year-round long-distance ocean swimmer, Steve Coopersmith is used to thriving in extreme, difficult conditions. Jurors make decisions not just on what they see and hear, but also on what they believe. Jurors tend to believe what they can understand. That’s where the expert’s communications skills come into play. The University of San Diego School of Law congratulates its notable alumni who appear on this list of top San Diego attorneys. The talents and expertise of the Thomas Jefferson School of Law faculty who collectively help drive the growing national and international reputation of the law school are exemplified by some of their recent noteworthy achievements. On many occasions and from many sources, including potential clients and patent attorneys, the phrase "stake in the ground" has been used to describe the purpose or goal of a provisional application. If one considers a provisional application to be a stake in the ground, to somehow capture an area of technology around a stake, all one will get is the stake. This is not a viable patenting strategy. The flaws of such strategy, previously significant for non-U.S. rights, now are magnified by virtue of the first to file provisions of the American Invents Act (AIA). The first-to-file provisions of the AIA will come into effect on March 16, 2013. Well-respected for their contributions to understanding of the law and to legal education, California Western School of Law associate deans William Aceves and Laura Padilla lend their considerable expertise and acumen to the day-to-day operations of San Diego’s oldest law school. Ensuring their plans are executed according to their wishes — and protecting them from unexpected pitfalls — is an important consideration for wealthy individuals. As such, a great deal of attention and press is paid to the importance of having a will or well-written trust document to ensure that your legacy is carried out. While this is a critical step, of equal importance is choosing the successor trustee — the person or entity that will carry out those wishes on your behalf. The U.S. Supreme Court typically makes it biggest splash at the end of a session, and this year was no different. SAN FRANCISCO — The Silicon Valley venture capital firm of Kleiner, Perkins, Caulfied & Byers has been generating buzz for decades, spotting early investment opportunities and making billions with companies like Google and Amazon. This summer, the attention is no different, but the reason for it is. When California Western School of Law students approach visiting professor Bob Seibel, they always have the same query: What's the best way to run a law practice? Online legal services are not going away, so traditional attorneys need to adapt to the changing marketplace, according to panelists at a San Diego Law Library event last month. With the dawn of flexible hours and technological advances, it’s a new age to be a female lawyer, according to a panel of female attorneys recently hosted by The Daily Transcript and sponsored by Union Bank. 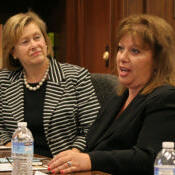 July 30, 2012 -- Julie Greenberg, a law professor at Thomas Jefferson School of Law and a 2012 Top Attorney, talks about the current topic of gender testing in sports. July 30, 2012 -- Judy Bae, an associate with Miller, Monson, Peshel, Polacek & Hoshaw and a 2012 Top Attorney, talks about some of the latest issues she's seeing in the world of probate litigation. July 30, 2012 -- Richard Wirtz, founder of Wirtz Law APC and a 2012 Top Attorney, discusses how his corporate litigation practice has entered the intellectual property law segment. Join us as we pay tribute to the best and brightest law practitioners in San Diego County.